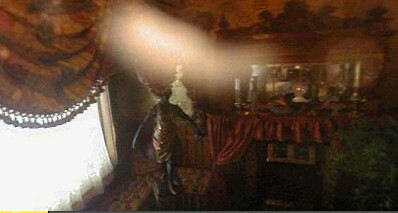 Uploader comment: I took this picture of a strange streak of light near a window at the Molly Brown house located in Colorado. The house is a well known place for hauntings and mysterious happenings. This light could be coming from the sun outside but I could not find an opening for light from the window drapes for it to seep through. What do you think? more interesting is that person under the light !!! i thought that is sculpture or sth, but ..
Ita a figurine, small statue!